Once again labor disputes have all but shut down the major West Coast ports and this time it’s between dockworkers and their employers. Companies are refusing to pay their employees extra and the workers have slowed their productivity rate as a pressure tactic costing everyone an estimated $2 billion dollars a day. For truck drivers, the slow down has meant waiting up to eight or nine hours for cargo, but the Teamsters say that a shut down will entitle them to unemployment benefits. 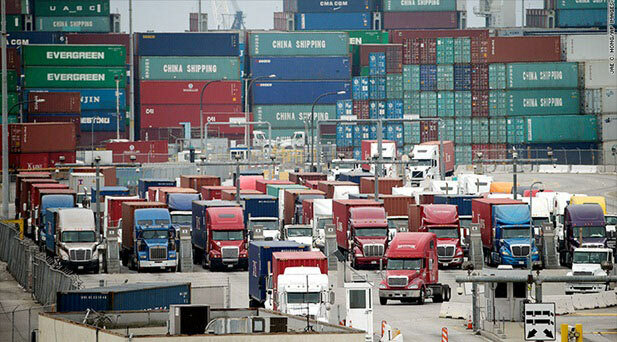 Following the port shut down that occurred over the President’s Day long weekend, the Teamsters announced that they would assist in providing unemployment benefits to drivers classified as independent contractors if the ports shut down again. Helping port truck drivers to resolve the labor dispute, which occurred last year about the misclassification of truck drivers as independent contractors, the Teamsters say that more than 10,000 drivers will be affected by the potential shutdown of the Ports of Long Beach and Los Angeles. They are teaming up with the Pacific Gateway Workforce Investment Network and regional community service groups to form a rapid response team, should the shut down occur. Again pointing to the rulings of the State Labor Commissioner, Employment Development Department and California courts determining that port drivers at some port trucking companies are being unlawfully misclassified, the Teamsters Local 848 says it will ensure they receive employee rights. “We’re going to make sure that each and every port driver at the Ports of Los Angeles and Long Beach knows that if there is a shutdown they can come here - to get the assistance they need.” says Teamsters Local 848 secretary treasurer, Eric Tate. He is referring to a rapid response team that will be set up at the Teamsters Local 848 union hall and in addition to providing assistance to port truck drivers in qualifying for unemployment benefits, they will provide other support services such as access to financial planners, food, medical referrals and utility assistance. "Our rapid response team will help the more than 10,000 misclassified independent-contractor drivers access financial and other assistance to help them through these tough times," Tate adds. It’s also important to realize that the effects of this standoff go far beyond the Los Angeles and Long Beach Ports. Already the Ports of Oakland and Seattle have been experiencing a "significant cargo buildup" where numbers of vessels a day are awaiting berths at marine terminals. Ships are arriving late and off schedule largely because of delays at previous stops in Southern California. The last time an extended port shut down occurred due to a lockout was in 2002, when a 10-day shutdown was finally forced to end by President George W. Bush issuing an executive order. Reports have indicated that President Obama is also prepared to intervene should the current port labor dispute result in a shutdown. The problem IS the union. Unions had their time in history. Now, in my opinion, they are the downfall of the economy. The Teamsters are going to weasel their way into the docks. Do you think they will just give these "benefits" to independent contractors without them signing some sort of contract? How are they planning on doing that when the largest shipping company pulled out of terminal 6 here in Portland are they willing to pay the truck for less freight? Yeah right. It's every man for himself is more like it. It's over now anyways. Ports will be back at operating capacity again now. Who gets to keep the money $$$$$$. You all think its the unions fault? So you'd rather continue getting a raise when they see fit as they make millions? Change what ever they want on you when they want? Its not the unions its the big companies that don't wanna pay u keep it on that poverty level so many are content with! Your wrong its the damn union. No I'm not. U know back in the 60's the average worker made 40,000 take a guess what today's average is? 36,000 now why u think that is? While 400 people 1% of the population own over 1/2 this country! Its cause they keep u believing Union is bad while guess what it is for them 1% cause now they have to bargain with u not just pay u the peanuts Ur accustomed too. Ya created it Cary, for live with it, for bet I cd guess your age within 3 yrs one way or the other, for are ya sure ya want to be a truck DRIVER? Sounds like ya just want money. Ain't goin to happen, for we ALL have family's we LOVE. Get Real BOY. No Worry, for WE'RE Truckers.